Homemade Halloween hippie costumes are easy to put together, because you can either find the makings of it in your attic or for a cheap price at a second-hand store. With a few specific articles of clothing, some embellishments and the right accessories, you will look like you are on your way to Woodstock. 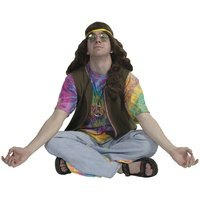 The color scheme of the outfit is whatever you want, but generally hippies wore a lot of earth tones with some bright colors and accessories. Find a pair of bell bottoms, the larger the "bells" the better. Hippie girls also wore long, flowing skirts that were either a plain earth color or had a colorful floral or paisley pattern. You will also need some patches to sew or iron on to your bell bottoms. Peace signs, yin yang signs and flowers are some of the things you could use as patches or on other accessories like necklaces. Find a shirt that has a retro, 1960's design and is made of light cotton. Hippie shirts are usually loose and airy with sleeves that come to a bell shape at the ends. Of course, you could also just wear a tie-dyed shirt. Wear some jewelry made of hemp with colorful beads, mushroom or peace sign pendants. Long beaded necklaces can also be worn, and many different kinds of woven or macrame bracelets and large rings. Mood rings were very popular in the 1960's and '70's, so wear one of these if possible. It the weather is cold, you can wear a suede or distressed denim jacket, preferably with fringe on the sleeves. You can also embellish your jacket with peace sign and flower patches. For accessories that are signature to a hippie costume, wrap a long, colorful bandanna or scarf around your head and wear a pair of round sunglasses. If the weather permits, wear sandals or even go barefoot if you can get away with it. If it's too cold for sandals, wear boots. You could also wear a brown, distressed leather belt. Draw a peace sign or a flower on your cheek or your forehead with lipstick. Other than that, any makeup that you wear should be minimal and natural-looking. Wear your hair down and free-flowing or braid it into two braids. Finally, find a fresh flower to put in your hair or just get a plastic or fabric one.